I ballasted the peninsula recently. It took me a long time to get started because I was pretty nervous about “doing it right”. Eventually I convinced myself to “just do it”. Watching a YouTube video or two helped. I had three packs of fine gray ballast that was supposedly the same colour. Two of them looked identical but one was darker, so I mixed all three together in a bowl to get a more or less uniform look. 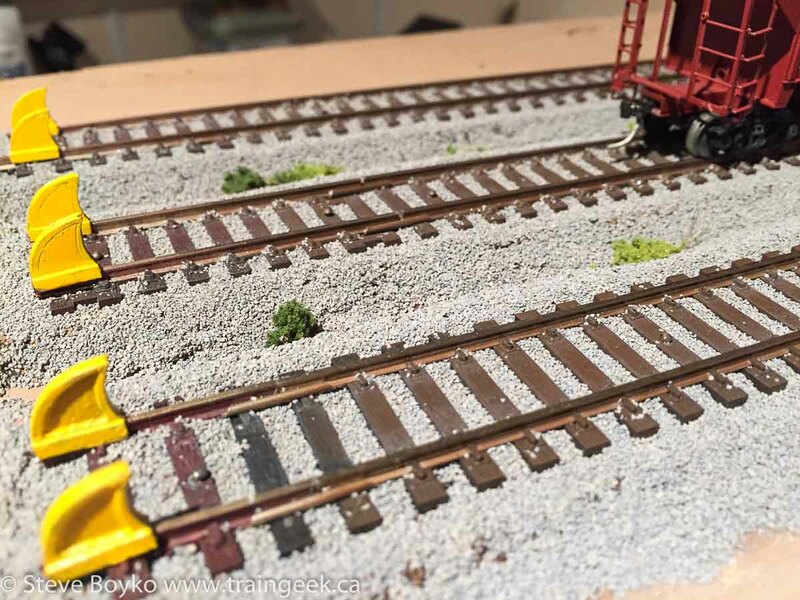 A little variation in the colour is OK.
There’s my ballast laying tools – a spoon to lay it down, then two sizes of paint brushes to move it around. It takes a bit of practice to figure out how much ballast to lay down and how to move it around. 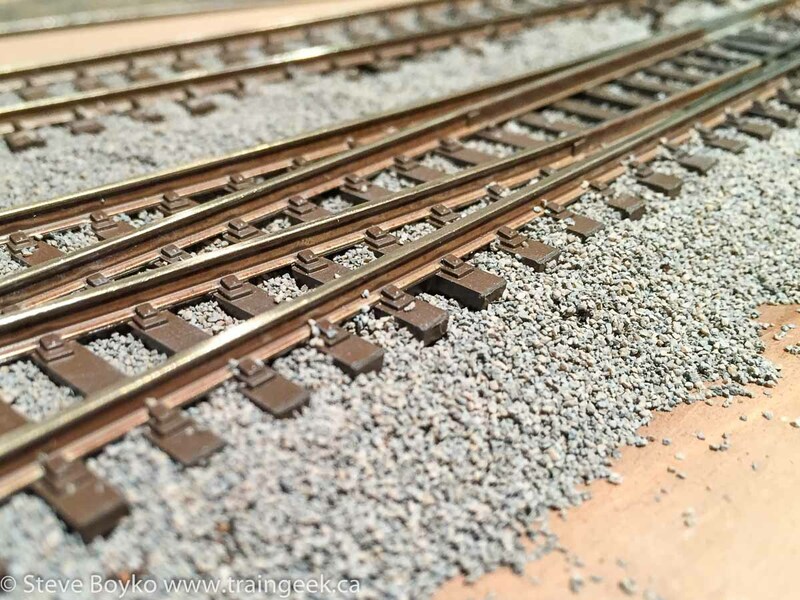 I put too much ballast down to start, so I had to sweep it down the track quite a ways to even it out. I still think I have a bit too much ballast down but it’ll do. Once the ballast was laid, it was time to glue it down. I filled a spray bottle with a mixture of tap water and isopropyl alcohol to wet the ballast down. The alcohol is there to cut the surface tension of the water so it will soak right through. The key is to mist it onto the track, rather than blast the ballast with a direct spray. 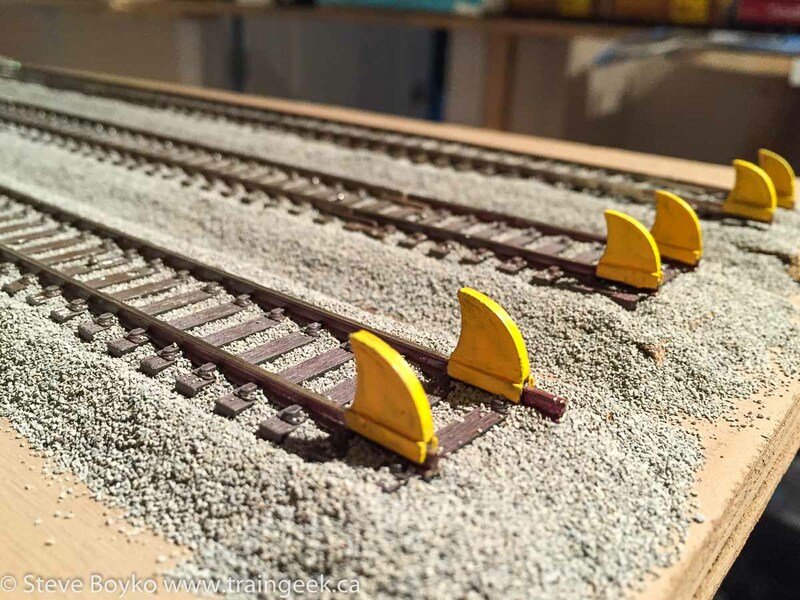 A bit of the ballast might move but you can always fix it up with a little nudge while it’s still wet. The key is to get the track soaking wet. I had paper towel standing by to soak up the excess before it dripped onto the floor. In another bottle I had a 50/50 mix of white glue and tap water. 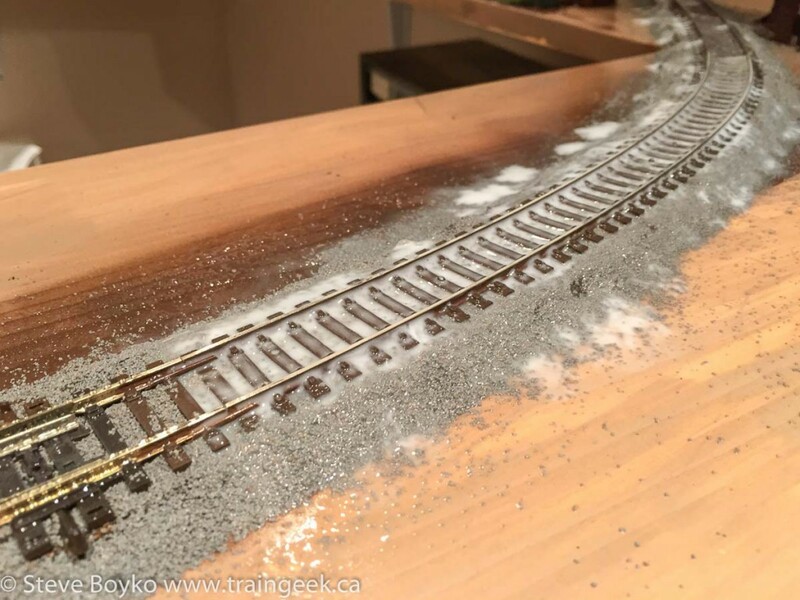 Once a section of track was totally wet, I dribbled the glue mix liberally onto the ballast. I ran a strip down between the rails then ran a strip or two on each side. Use lots of glue. Again, paper towel is handy to get the runoff. It looks terrible, but just walk away and let it dry… thoroughly. When it’s dry, the ballast is firmly held in place and will not come off. I used a vacuum cleaner to scoop up the excess and to find areas that didn’t get enough glue. There were a few patches where the water or glue had caused a bit of a washout, so I patched those up with the same method. 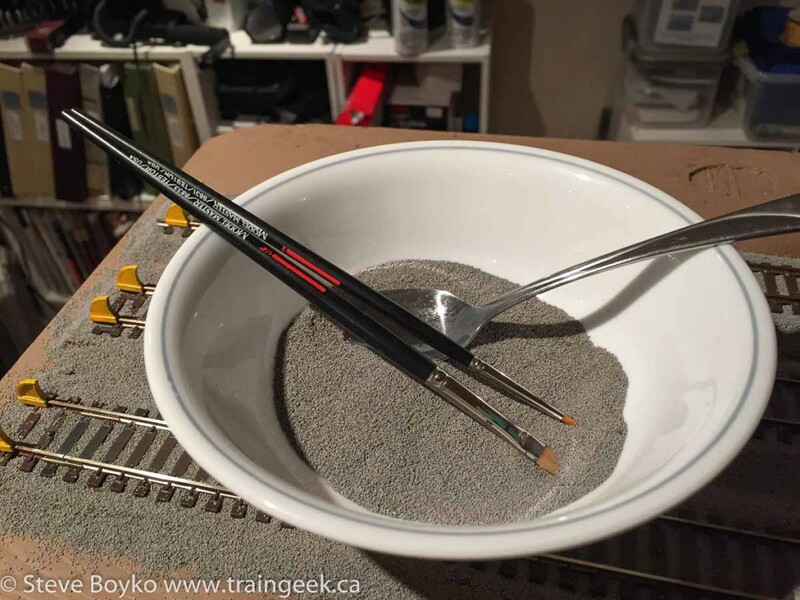 Just be careful not to put too much water on as it could soften up the already ballasted parts. It looks pretty good once dry, if I do say so myself! I had a visitor comment that it looked like it was just laying there. I encouraged her to touch it to show it wasn’t going to move. In the following photo you can see that I’ve started to add some weeds. I have a lot of “weed work” left to do but it’s looking good from a few feet away. 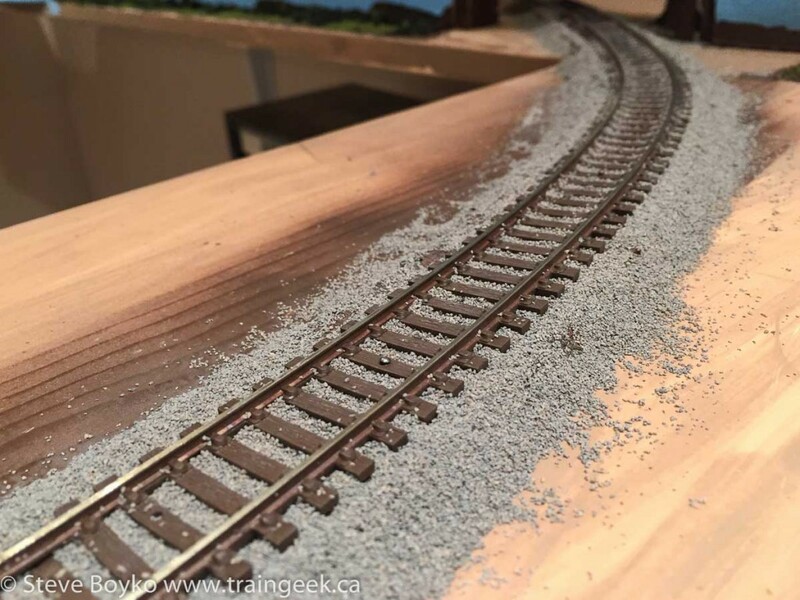 PS Check out this post by TomW showing the construction of the T&K Railway round-the-room Lionel line. Such craftsmanship!